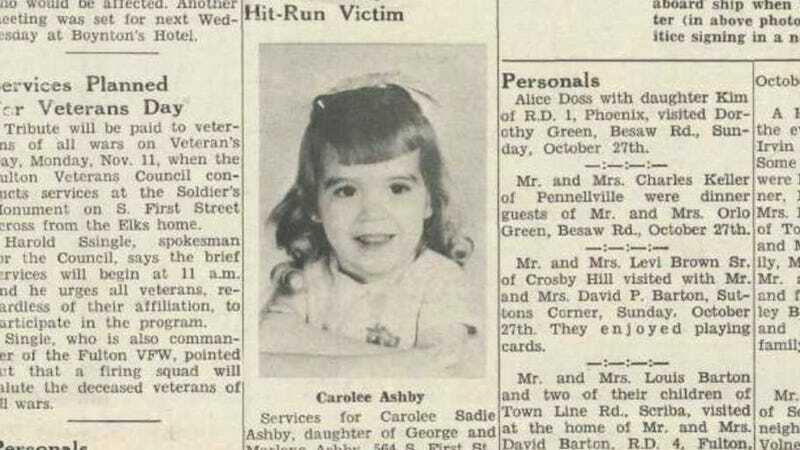 On Halloween of 1968, 4-year-old Carolee Sadie Ashby of upstate New York was struck and killed by a driver at an intersection as she walked home from trick-or-treating with her sister and cousin. For 45 years, police have been unable to identify the driver responsible for the little girl's death and have only now, in 2013, succeeded in finding the culprit behind the hit-and-run, thanks to the help of Facebook. In recent history, social media has been hit or miss when it comes to solving crimes. In one incident, commenters were able to track down the identity of a subway mugger within a day of his image being released (something that the police weren't able to do in a month), but in more recent history, internet speculation and online amateur detective sparked a full-on witch hunt for the Boston Bomber suspect that led to the extreme harassment of one innocent and missing young man's already grieving family. In the case of Carolee Sadie Ashby, however, a Facebook user was able to correctly identify 62-year-old Douglas Parkhurst as the driver who didn't stop after striking Ashby with his car. Last year, when retired cop Lt. Russ Johnson posted the details of the case on the social network site, a woman recognized the circumstances and contacted police with new information about how, in 1968, she was approached by Parkhurst's family about coming forward as a false alibi for the night of October 31st. The woman declined and was never informed of what it was that they wanted her to cover up. Parkhurst was originally questioned at the time of the crime, but there wasn't enough evidence to hold him. Since the woman has come forward, the case has been reopened, Parkhurst has been requestioned and he has admitted to the crime, saying that he was intoxicated the night that he hit Carolee. The statute of limitations has expired on the case and he will not be charged.